A reservation center is a unique combination of dozens of computer workstations and a few semi-private cubicles. Such a set up is easily created with Screenflex Portable accordion walls. 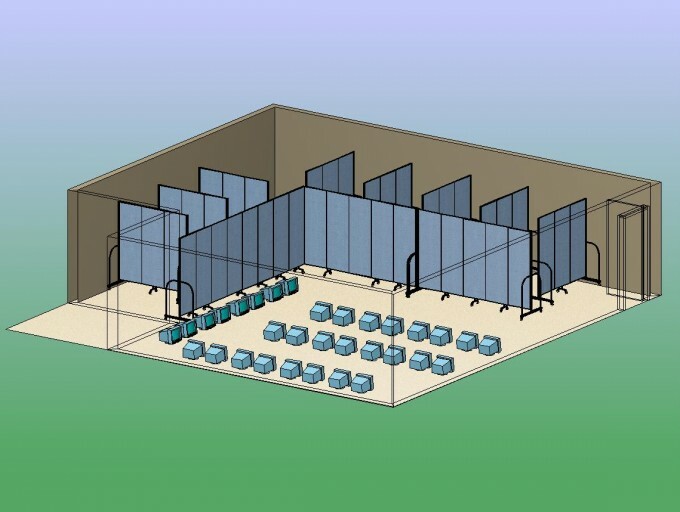 In this plan, it only takes 10 portable walls to create 8 cubicles and one large separate area for 32 computer stations. Each cubical is approximately 6’0″ wide by 6’0″ long, which is ample room for a desk and chair. The acoustical dividers help cut down the sound in the area, and as needed the portable partitions can be rearranged.